Rice pudding is the quintessential comfort food – sweet, creamy and utterly delicious. Vegans can enjoy this satisfying dish as blogger Jacqueline Meldrum has a found a way to keep it not only creamy but dairy-free too. 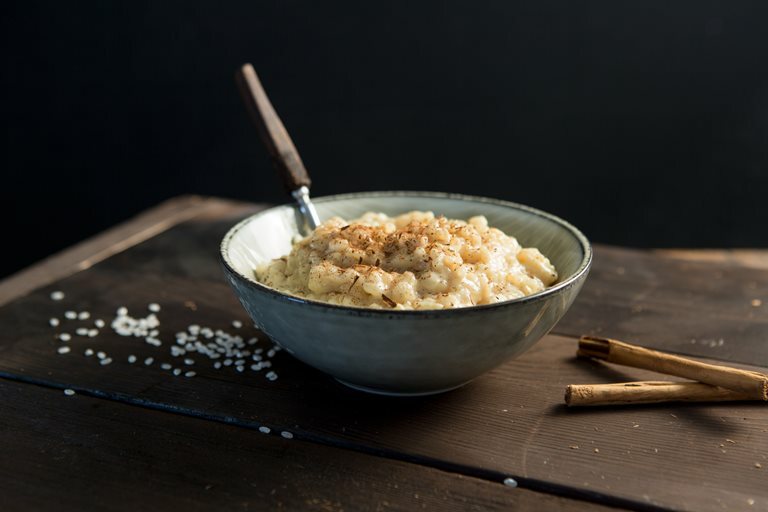 Rice pudding conjures up wonderful memories of my mum producing a large glass casserole dish full of steaming, creamy rice pudding she had just pulled from the oven. I know some people have bad memories of rice pudding and tapioca from their school days, but believe me, when it’s homemade with love, nothing beats it. I usually make rice pudding with fresh milk, but this time I made it dairy free for my husband who’s vegan. He had a huge smile on his face as he tucked in and even though I made him a massive bowlful, he still asked for more. My recipe uses soya milk, but feel free to substitute this for whole or semi-skimmed milk, if you don’t have vegan or lactose intolerant guests. Usually when I make rice pudding, I finish it off with a grinding of fresh nutmeg, but this time I decided to introduce different spices. I cooked the rice with some ground cinnamon and ginger, then just before serving I grated some fresh cinnamon on top. Now I love cinnamon, but I only recently came across fresh cinnamon sticks from Cinnamon Hill. They sell freshly harvested Ceylon and Saigon cinnamon sticks. The Ceylon comes from Sri Lanka and has a warmth that is almost citrussy and the Saigon comes from Vietnam and has some heat to it as well as sweetness. The difference in flavour between bottled ground cinnamon and freshly grated is immense. I made enough for one rather large bowlful, but you can easily multiply the recipe for more servings. Also I cooked my rice pudding gently on the cooker top, but you could pop it in the oven, check on it occasionally and add more milk if it needs it.